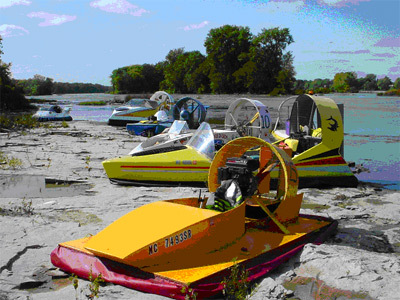 Come join your fellow Great Lakes Area Hovercraft enthusiasts for a weekend of great cruising on the scenic Maumee River near Toledo, Ohio. Rock ledges and a variety of conditions from mini-rapids to smooth shallow water make this river an inviting September destination for hovercraft cruisers. On Saturday, we'll cruise downstream toward historic Fort Meigs and have lunch in the old downtown of Perrysburg, then cruise back up stream to Grand Rapids (site of the Apple Butter festival held in Oct). Sat. evening we trailer up the craft and drive to the camp ground (Mary Jane Thurston State park). Sunday we launch on the upstream side of the dam, and head up to Definance on a 60 mile round trip cruise. Meet at the Waterville park boat launch at Noon on Saturday. Take exit 4 (US 24) from the 475/23, and head south west approx. 5 miles to Waterville. Pass through the town and look for the 3rd Metro Park sign on left side of the road. It's the sign that says "boat launch".